Tea can be a gentle way to keep the body in line every day, including hormones, mood, digestion and sleep. These are things many women struggle with, and keeping a wide variety of therapeutic teas on hand can be a great way to help yourself feel better fast. Since many prepared tea bags have natural or artificial flavors added, we recommend buying organic, loose, dried herbs and steeping them in a mesh basket or ball. This way, you know exactly what is in your cup of tea. It also means that you can make your own delicious blends. Many health food and herb stores have a bulk dried herbs section, which makes for a fun shopping experience. The herbs and blends look beautiful displayed in glass jars in the kitchen. It is good to note, however, that particularly for medicinal herbs, storing them in a cool, dark, dry place preserves the active constituents best. Using organic herbs ensures that the brew you make to support your health is not full of pesticides. Many of the herbs described below are easy to grow. This is the best way to ensure that the plants are of the highest quality and will provide the most beneficial effects. So without further ado, here are the top 12 teas to keep stocked in your pantry and desk drawer — you can even take them on the go in your purse. These natural remedies are great for preventative health, and they can safely soothe any illness that you or your children experience. This one is clearly a mainstay of herbal teas. Known to have calming effects on the digestive system, peppermint tea is great for those days when your tummy feels unsettled or a little gassy. It also helps freshen breath and discourages the growth of bacteria in the mouth. The active component menthol can relieve congestion from a cold or flu, and help expel phlegm from a chest cold. Peppermint can also be used in a blend with fennel and ginger to relieve nausea. Did your parents give you ginger ale when you were sick? This home remedy is based on the medicinal capabilities of ginger root, although the soda version probably doesn’t contain many of its benefits. Using dried ginger, or even the fresh root, is a great way to make a tea that relieves coughs and sore throats, reduces nausea and motion sickness, and provides a warming sensation throughout the body. Ginger can make a great immune-boosting and pain-relieving tea for any aches and pains. To make tea from fresh ginger root, simply take a thumb-sized piece and grate it. Squeeze the juice out of the pulp into your tea cup, then add hot water and a little raw honey. A squeeze of fresh lemon tops off this health-boosting tea. This amazing tea is made from a fungus that grows on birch trees in the northern part of North America and Northern Europe. It makes a delicately sweet, earthy tea that tastes a little like maple sap before it has been boiled down into maple syrup. The tea provides immune-boosting benefits and is said to be one of the most potent cancer fighters. It’s a great idea to drink some chaga tea regularly as a preventative measure. Simply put a few chunks of dried chaga into a small pot and cover with water, then simmer for about 20 minutes with the lid on. Raspberry leaf tea is rich in vitamin C and phenols, which are said to be extremely helpful for women’s health. Drink this tea to help ease menstrual cramps and tonify the uterus. Simply steep a teaspoon of dried leaves in a loose-leaf tea strainer for 10 minutes and enjoy. The tea has a pleasantly mild, sweet flavor. The pungent, earthy, slightly bitter taste of dandelion root tea is known as a popular coffee alternative. The roots support bile production so this is a great choice if you suffer from sub-par digestion or experience constipation. Use a ready-made tea bag or steep a tablespoon of the dried root in a covered teacup for 10 to 15 minutes. This tea, made from the bark of a South American tree, has a myriad of healing properties. It’s a pleasant, earthy tea which helps boost the immune system, calm anxiety and discourage yeast overgrowth. Definitely an all-around helper for every woman. Make a strong medicinal brew by steeping two teabags in a covered cup for at least 10 minutes. Chamomile tea is the quintessential calming brew. Buy loose dried flowers to enjoy the pretty blossoms while you steep some to sip before bedtime. This is a great anxiety reliever to keep around the office or in your purse for frequent consumption. Don’t go anywhere without a few bags of organic green tea stashed away in a pocket. With just the right amount of caffeine to provide a little energy boost, green tea is the perfect morning beverage. It’s packed with antioxidants that help repair cellular damage and keep you looking younger. Daily consumption can even reduce the chance of sunburn. This nourishing South African tea is probably the most enjoyable caffeine-free alternative to black tea. Its flavonoids are said to have anticancer properties. 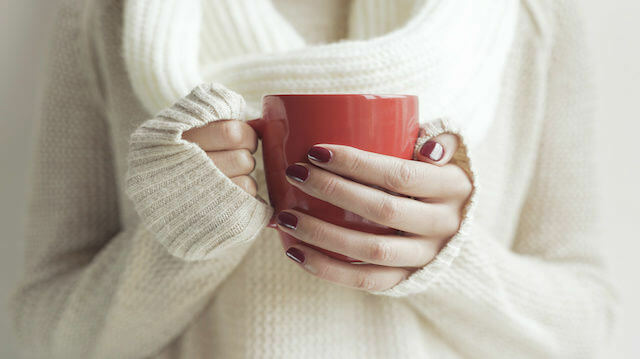 Enjoy a cup in the afternoon instead of consuming more caffeinated drinks. This fragrant tea was used by ancient Greeks as an overall health tonic. Add it into your tea rotation to help fight off viruses, calm anxiety, support good sleep and soothe the digestive system. The plant grows easily in a warm environment with rich soil, so try growing your own! Full of warming and nourishing spices, chai tea is perfect for cold weather. Buy it ready made or make your own with cardamom pods, clove, cinnamon and black tea. Try finding a caffeine-free version, such as rooibos chai, so that you can enjoy its warm, toasty flavors in the evening. It also makes a great sugar-free dessert alternative — or maybe add just a little raw honey. Drinking nettle tea has been said to help relieve seasonal allergies, especially when a little locally sourced raw honey is mixed in. Overall it’s a nourishing tonic that supports the immune system and wards off illness. And don’t worry, it doesn’t sting! Try buying ready-made tea bags, or buy the loose herb and steep in a mesh strainer. You can even pick your own young, fresh nettle in the spring (wear gloves!) and dry it in a paper bag, after which it will lose its ability to sting. Now that we’re all stocked up on tea, looking for more relaxing rituals to enjoy? Check out the benefits of a sauna or steam room here. Hey Buddy!, I found this information for you: "Why Every Woman Should Drink These Teas". Here is the website link: https://www.thealternativedaily.com/every-woman-should-drink-these-teas/. Thank you.